City Manager Dan Wright discusses the purchase of new system controls for the city's water department during the Aug. 27 Ringgold City Council meeting. 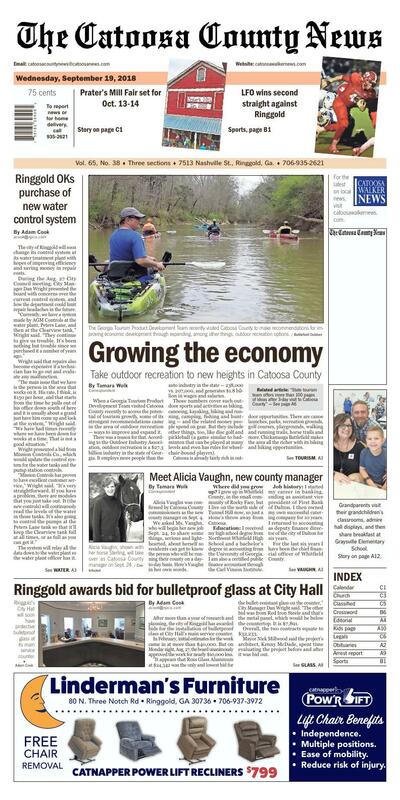 The city of Ringgold will soon change its control system at its water treatment plant with hopes of improving efficiency and saving money in repair costs. During the Aug. 27 City Council meeting, City Manager Dan Wright presented the board with concerns over the current control system, and how the department could limit repair headaches in the future. "Currently, we have a system made by AGM Controls at the water plant, Peters Lane, and then at the Clearview tank," Wright said. "They continue to give us trouble. It's been nothing but trouble since we purchased it a number of years ago." Wright said that repairs also become expensive if a technician has to go out and evaluate any malfunction. "The main issue that we have is the person in the area that works on it. His rate, I think, is $150 per hour, and that starts from the time he pulls out of his office down south of here and it is usually about a grand just have him come up and look at the system," Wright said. "We have had times recently where we have been down for weeks at a time. That is not a good situation." Wright presented a bid from Mission Controls Co., which would update the control system for the water tanks and the pump station controls. "Mission Controls has proven to have excellent customer service," Wright said. "It's very straightforward. If you have a problem, there are modules that you just take out. It (the new controls) will continuously read the levels of the water in those tanks. It's also going to control the pumps at the Peters Lane tank so that it'll keep the Clearview tank full at all times, or as full as you can get it." The system will relay all the data down to the water plant so the water plant officer has it. The system will also allow operators to log in remotely so they can tell what pump is running, what pump is not, and if there's a problem with a pump. "It will also dial out to our operators...it'll wake them up in the middle of the night and tell them that there's something going on," Wright said. Wright says the sewer department already uses the Mission Control system, and that upgrade the water department will create a more uniform operating system. "It's something we can build with and we can have one system instead of two," Wright said. "Mission Control has proven themselves." The council unanimously approved the purchase of the system in the amount of $10,886.80. "The cost of $10,886.80, that's a sole source," Wright said. "We feel that just in repairs alone, just in two to three years, we will save that much money from having to have the AGM folks to come out and work on it the way they have continuously done. You're up against an aging control system, so either you're going to spend money on repair costs, or spend it on getting something new that will work." The Georgia Tourism Product Development Team recently visited Catoosa County to make recommendations for improving economic development through expanding, among other things, outdoor recreation options. When a Georgia Tourism Product Development Team visited Catoosa County recently to access the potential of tourism growth, some of its strongest recommendations came in the area of outdoor recreation — ways to improve and expand it. There was a reason for that. According to the Outdoor Industry Association, outdoor recreation is a $27.3 billion industry in the state of Georgia. It employs more people than the auto industry in the state — 238,000 vs. 207,000, and generates $1.8 billion in wages and salaries. Those numbers cover such outdoor sports and activities as biking, canoeing, kayaking, hiking and running, camping, fishing and hunting — and the related money people spend on gear. But they include other things, too, like disc golf and pickleball (a game similar to badminton that can be played at many levels and even has rules for wheelchair-bound players). Catoosa is already fairly rich in outdoor opportunities. There are canoe launches, parks, recreation grounds, golf courses, playgrounds, walking and running trails, horse trails and more. Chickamauga Battlefield makes the area all the richer with its biking and hiking opportunities. Much of what the development team recommended for the area in the way of outdoor recreation has to do with adding appeal and pizazz to what already exists. They suggested adding pickleball to the agenda at Jack Maddox Park, to go along with the park's disc golf and fishing rodeos. They also suggested adding shaded picnic areas and a splash pad. Partnering with other attractions is also listed as a suggestion in the report the team produced, including working with the Chattanooga Audubon Society and working with Lake Winnie to paint a mural on the metal silo next to the sports fields. Murals are a significant part of the team's recommendations. They suggested they be added along trails near canoe launches and in other public places. Keeping with the art theme, the team also suggested "contemplative painting in nature" — setting up nooks along nature trails where artists can sit with their colors and canvasses and recreate the beauty they see before them. Public art in the form of sculpture was yet another suggestion for recreation areas. The team suggested partnering with libraries and literary groups to develop reading, poetry and theater hikes, including some about the Trail of Tears. Numerous suggestions were made for upgrades to existing public spaces, from resurfacing paths and wood walkways to installing new playground equipment, adding more benches and picnic tables and improving fire pits. Adding a "low ropes course" to attract corporate and youth retreats was a suggestion for Elsie Holmes Park, as was the idea of adding treehouse lodging. Signage to help visitors and locals find their way was a big part of the recommendations, with a focus on uniformity so people can easily spot the next turn in a trail or take the right path at a fork. Also suggested was hand-cranked solar recording boxes that tell the stories of different areas, more reliable devices than some of the current recording boxes that have broken down in some locations. And speaking of sound, the team suggested interactive elements to walking and hiking trails — bells people can ring, drums, whistles that sound like wildlife, along with interpretive panels that depict the history and stories of the area. The team suggested that Battlefield Outdoors in Fort Oglethorpe add a giant map on a wall, showing biking and kayaking/canoeing areas, and also provide a digital route using the free "Ride with GPS" service, and mentioned that a grant might be sought from the Lyndhurst Foundation for the project. They also suggested the business, which already sells and rents bikes, e-bikes, canoes and kayaks, might want to add windsock couches to its inventory — inflatable sofas that can be carried in a backpack and "blown up" by waving them and scooping air into them. A larger project that was recommended was creating a smooth and safe biking pathway from Chattanooga to Chickamauga Battlefield. "Cycling to the Battlefield from Chattanooga," says the report, "is a frightening proposition even for the most experienced cyclist." The team said they would like to see Fort Oglethorpe as part of the biking experience rather than a place people simple drive through to get to their biking destination. "Finding a safe way for cyclists to ride to the Battlefield from Chattanooga would encourage them to see Fort Oglethorpe in a different light — at a slower pace — and allow them to plan excursions that include restaurant stops, rather than simply driving back to Chattanooga from the Visitors Center after their ride." According to Outdoor Industry Association, 58% of Georgians engage in some sort of outdoor recreation. The Georgia Tourism Product Development Team believes that capitalizing on that will help Catoosa County and its cities grow economically and will improve what the area has to offer its own residents. Related article: "State tourism team offers more than 100 pages of ideas after 3-day visit to Catoosa County"
Alicia Vaughn, shown with her horse Sterling, will take over as Catoosa County manager on Sept. 24. Alicia Vaughn was confirmed by Catoosa County commissioners as the new county manager on Sept. 4. We asked Ms. Vaughn, who will begin her new job Sept. 24, to share some things, serious and lighthearted, about herself so residents can get to know the person who will be running their county on a day-to-day basis. Here's Vaughn in her own words. Where did you grow up? I grew up in Whitfield County, in the small community of Rocky Face, but I live on the north side of Tunnel Hill now, so just a stone's throw away from Catoosa. Education: I received my high school degree from Northwest Whitfield High School and a bachelor's degree in accounting from the University of Georgia. I am also a certified public finance accountant through the Carl Vinson Institute. Job history: I started my career in banking, ending as assistant vice president of First Bank of Dalton. I then owned my own successful catering company for 10 years. I returned to accounting as deputy finance director of the city of Dalton for six years. For the last six years I have been the chief financial officer of Whitfield County. Family: I have two wonderful daughters. Gracen attends UGA and Gillian is a sophomore at Northwest High School. I married my childhood sweetheart 25 years ago. My husband, Gandi Vaughn, is a trial attorney in Dalton. Pets: I love my five horses, three dogs and two miniature donkeys, Wilbur and Buttercup (Buttercup thinks she is a dog). Hobbies: Hanging out with my horses, reading and exercising. Favorite person from history and why: Abraham Lincoln because he kept our country together during a very difficult period in our history. Someone who has had a deep influence on your life and how: Mike Babb, former chairman of the Whitfield County Commission. I worked with him when I was finance director and he taught me about leadership. One of his favorite quotes was from Justice Robert Benham of the Georgia Supreme Court — that when you are looking for quality traits for persons in leadership, that person should be open-minded, level-headed, even-handed, sure-footed and grounded in values. Mike taught me to remember every citizen is important and should be treated with respect. Interesting anecdote from your childhood: I loved to fish with my grandfather after school each day in our backyard pond with an old rod and a loaf of Sunbeam bread we used as bait. An event in your life that has helped define the kind of person you are: My grandfather lived with us for many years when I was growing up. I learned from that experience to love your family, to be kind and respectful to your friends and neighbors and to always help those less fortunate. Something people may not know about you: I love kickboxing. What made you decide to seek the position of Catoosa County manger? When I look back on my career as CFO, my favorite times were working with department heads and other local governments and school districts, helping them do their jobs, and bringing people together as a team to solve the big problems facing the county. What do you feel you bring to your new position in Catoosa County, what are your greatest strengths? I enjoy learning new things and am always willing to listen to other viewpoints. I believe one of my greatest strengths is the ability to take these different viewpoints and ideas and find a common-sense way to get those people on the same page and working together for the county. I bring a strong background in government finance, 12 years of local government experience, not only managing my own staff but working with local cities and school districts and helping entities meet common goals within the community. What do you consider the top responsibilities of a county manager? Supporting the work of the department heads, understanding the concerns of citizens and implementing the vision of the commissioners. What will your first month on the job look like? A ton of meetings to get to know all the department heads and get an understanding of the community's needs. Anything you'd like to say? I will have an open-door policy for citizens and employees alike, so come and see me. I am excited about working with the elected officials and the people of Catoosa County and making a difference. Ringgold's City Hall will soon have protective bulletproof glass at its main service counter. Mayor Pro Tem Terry Crawford, who has been an advocate for getting protective glass at City Hall, looks over bid information during the Aug. 27 City Council meeting. After more than a year of research and planning, the city of Ringgold has awarded bids for the installation of bulletproof class at City Hall's main service counter. In February, initial estimates for the work came in at more than $40,000. But on Monday night, Aug. 27, the board unanimously approved the work for nearly $10,000 less. "It appears that Ross Glass Aluminum at $24,342 was the only and lowest bid for the bullet-resistant glass on the counter," City Manager Dan Wright said. "The other bid was from Red Iron Steele and that's the metal panel, which would be below the countertop. It is $7,891. Overall, the two contracts equate to $32,233. Mayor Nick Millwood said the project's architect, Kenny McDade, spent time evaluating the project before and after it was bid out. "Kenny did think that that was a fair bid, and he's worked with the contractor before," Millwood said. Although the work is approved, Wright said there isn't a definite timetable yet for when the work will be started and completed because the glass has to be specially ordered. Mayor Pro Tem Terry Crawford, who's been the biggest advocate for the project, believes the glass will give employees a better sense of security. "I'm sure we've all seen what's going on with violence around the world," Crawford said when he first proposed the idea. "It's a sad thing to think about, but it could happen to us right here. We have ladies that sit up there at that front office that are actually scared from time to time, and our employees should not be afraid to come to work."